For most of the Nigerian poor, growth is just an irony. Despite the fact that Nigeria has one of the largest economy in Africa and boosted its average GDP growth, growth has done little for the poor. An article ‘When Will Poverty Level Reduce in Nigeria?’ reminds me of my paper drafted two years ago, which I have never revised or published and even forgot I wrote it. As it could be food-for-thought, I would like to share some findings from my quick analysis. 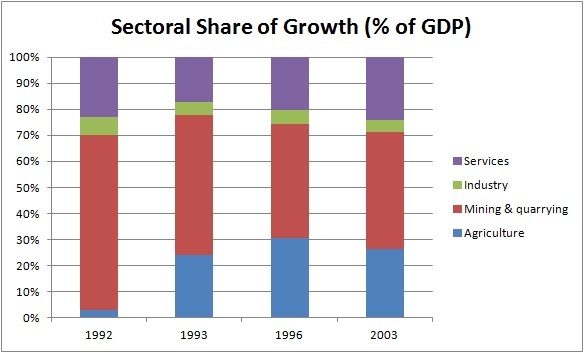 Nigeria has been enjoying a dramatic economic growth in the past decades. The trend of GDP per capita shows a gradual and constant rise over 30 percent since 1985. According to the trickle-down theory in this case, Nigeria should have experienced poverty reduction at the same period. As seen in the table, the economic trickle-down to the poor did not happen. The poverty headcount ratio clearly shows an upward trend from 62 percent to 68 percent between 1985 and 2009, although it slightly improved in the period of 1996-2003. The other poverty indicators such as poverty gap and poverty squared gap also follow the same trend. The increase in overall economy and poverty results in worsening inequality. 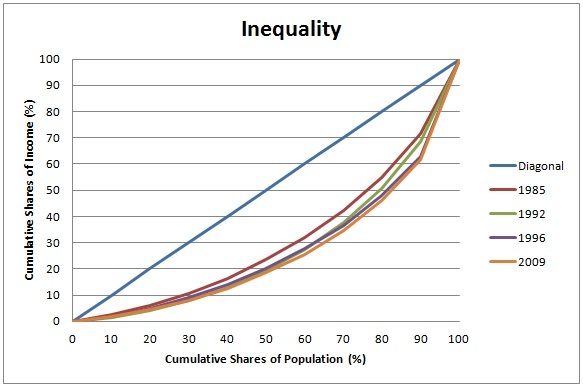 There was a steady increment in Gini coefficient from 39 to 49 for the same period. Inflation could be a part of these adverse effects on poverty and inequality. Inflation is generally believed as a constraining factor of poverty reduction as well as macroeconomic instability. In the country, the level of consumer price inflation was extremely high beyond 10 percent per annum for the period. Moreover, there were great fluctuations in the trend. Its situation was the worst from 1985 to 1996, demonstrating 20 to 40 percent of annual inflation, when poverty and inequality diminished. Although the inflation level is relatively low in the 2000s, over 10 percent of inflation in goods appears to refuse economic growth to reduce poverty, which levels off above 60 percent. The growth pattern was mostly not good for the poor. It is simply necessary that the poor’s consumption level should improve to reduce poverty; in other words, the growth pattern needs to be pro-poor. 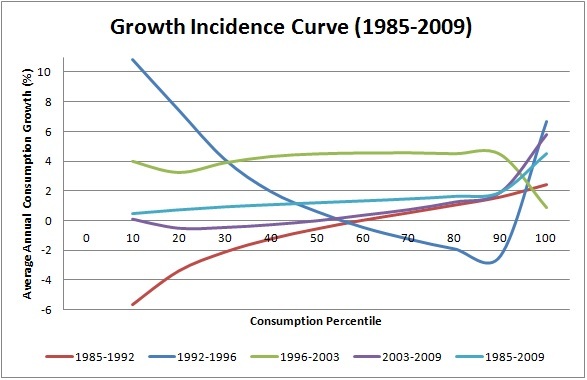 The growth incidence curve (GIC) provides an insight whether or not the pattern is favour of the poor. In the period of 1985-1992 and 2003-2009, the GIC demonstrates a typical upward curve. In these periods, only the few richest people enjoyed growth of consumption. 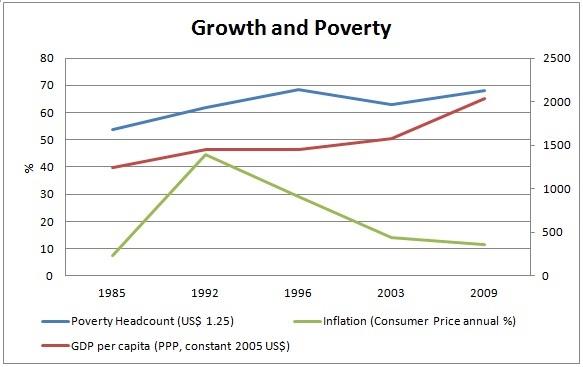 This trend contributes to shaping the overall trend of anti-poor growth pattern in 1985-2009. In 1992-1996, the growth pattern looks relatively pro-poor up to 10 per cent of annual consumption growth, which reflects on the fact that inequality among poor people (poverty squared gap) slightly declined although poverty headcount and gap increased. In 1996-2003, the growth pattern seems better for the poor compared to the rich. The sectoral pattern of growth may not have provided enough benefits for the poor. 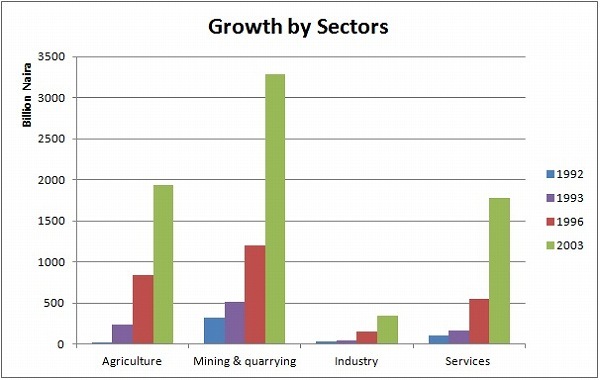 The graph shows that the mining and quarrying sector explicitly led the growth. 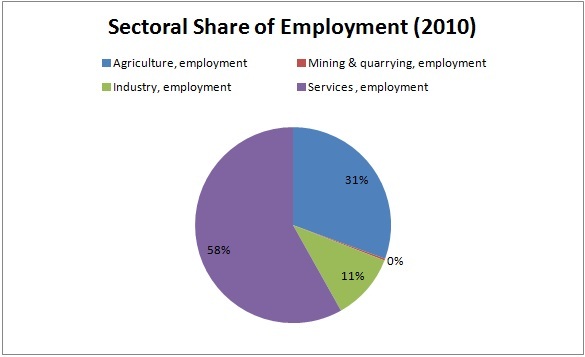 However, this sector employs very few people in the country. It indicates that the growth benefits were distributed among those limited populations. On the other hand, agriculture and services grew dramatically from the late 1990s. This could have provided a certain positive impact on poverty reduction, since those employs most workers in the countries. Above all, although there were some positive observations in the sectoral pattern of growth, the pattern was not strong enough to reduce poverty significantly. Ippei Tsuruga. 2012. 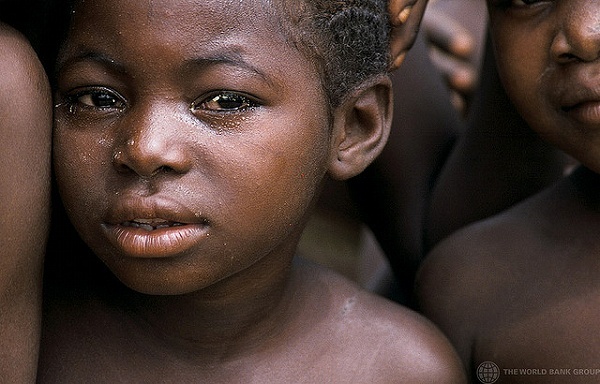 Why does growth have little impact on poverty reduction in Nigeria?